Petrochemicals, derived from the cracking of crude oil or natural gas, have been a part of the manufacturing industry since the 19th century. They were first incorporated into manufacturing as a cheap substitute for natural products. Used in everything from medication to plastics, while petrochemicals are generally safe as their finished products, in their raw form they can be highly toxic and acidic and must be handled with care. Major petrochemicals include acetylene, benzene, ethane, ethylene, methane, propane and hydrogen. From these, hundreds of other chemicals are derived. These derivatives are used as elastomers, fibres, plasticisers and solvents, and as feedstock for the production of thousands of other products. It is apparent that toxic chemicals in the petrochemical industry have resulted in health impacts, occupational diseases and unhealthy working environments. Based on numerous risk and Environmental Impact Assessment (EIA) studies carried out by various professionals and organisations, it has become apparent that the petrochemical industry exposes personnel and surrounding communities to numerous health, safety and environmental hazards. These hazards are mainly due to the toxic chemical products and associated obnoxious gas fumes, which include sulphur oxide, nitrogen oxide, carbon monoxide, volatile organic compounds, fugitive hydrocarbons and dust. For decades, air toxins have been associated with both short term and long term adverse health effects. Known organ systems impacted include the cardiovascular, respiratory, reproductive and nervous systems. Long term health effects can include increased risk of mortality, lung cancer, chronic respiratory disease and heart disease, as well as damage to the liver and potentially the kidneys. Persons are exposed to toxic chemicals in the air of their communities, homes and workplaces. Exposures tend to be greatest in workplaces where toxic chemicals are used and leaks or contaminated work spaces can occur. Continuous and systematic, safety management systems proactively identify hazards and analyse the associated risks. Implementing such a system also enables the efficient distribution of safety resources in the high risk environment of a petrochemical plant. To ensure safety of the environment and workers, it is imperative that chemical plants operate at optimum safety levels – starting with safe design. The intrinsic safety for the petrochemical plant should use technological measures to eliminate or control risks and to prevent accidents. Health and safety in the petrochemical industry is best tackled from two different perspectives: process safety and occupational health and safety. The focus of process safety is prevention. Occupational safety primarily covers the management of personal safety; however, well-developed management systems also address process safety issues. The tools, techniques and programmes required to manage both process and occupational safety can sometimes be the same, such as a permit to work system. 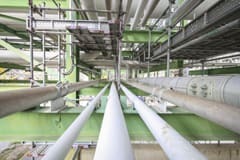 Process safety involves the prevention of leaks, spills, equipment malfunction, over-pressures, over-temperatures, corrosion, metal fatigue and other similar conditions. In the petrochemical industry, programmes of process safety should focus on design and engineering, training and maintenance of equipment. Effective process safety is the outcome or result of a wide range of technical, management and operational disciplines. Process control is used to protect the three Ps: people, plant and the planet. These systems are not intended for controlling the process itself, but rather for protection. Process control is performed by means of process control systems (PCS) and is interlocked by the safety systems so that immediate actions are taken should the process control systems fail. Process control and safety systems are usually merged under one system, called the Integrated Control and Safety System (ICSS). The SSS shuts down the facilities to a safe state in case of an emergency situation, thus protecting personnel, the environment and the asset. The SSS manages all inputs and outputs relative to emergency shutdown (ESD) functions. Fire and gas system The main objectives of the fire and gas system are to protect personnel, environment and plant, including equipment and structures. Due to closing ESD valves in a process, there may be some trapped flammable fluids. These must be released in order to avoid any undesired consequences such as pressure increase in vessels and piping. For this, EDP systems are used in conjunction with the ESD systems to release, to a safe location and in a safe manner, such trapped fluids. Pressure Safety Valves (PSVs) PSVs are mechanical devices and are usually used as a final safety solution when all previous systems fail to prevent any further pressure accumulation and protect vessels from rupture due to over pressure. The following OHS elements will assist in safeguarding employee’s health and safety in the petrochemical plant: training, emergency preparedness and safety culture. Safety training Simple safety training such as identifying unsafe work procedures or conditions, wearing personal protective equipment (PPE) such as safety glasses and gloves while handling petrochemicals, and being aware of environmental anomalies such as stray smells or smoke, can keep a petrochemical facility running safely and without incident. Training employees on safety around these hazardous chemicals during normal operation is necessary, but it is also necessary to train all employees on what to do should an accident occur. Standard hazardous material procedures include shutting down all electrical activity in the event of a flammable spill, using surrounding safety equipment and other resources to contain a spill or evacuation management to get everyone out of harm's way. Emergency chemical spill treatment Since many petrochemicals can burn the skin or damage the eyes, all those working with petrochemicals should be made aware of special emergency treatment for personal contamination with chemicals. Employees should be informed to make note of the nearest restroom and any emergency wash areas located nearby their work station. Additionally they should be informed that spills on the skin or eyes should be flushed with copious amounts of filtered water to minimise damage, and victims of inhalation should be taken out into fresh air as soon as possible. Safety culture The concept of safety can be defined as the smallest possible or acceptable risk, whereas risk is the product of possible damages and the probability of their occurrence (Grote, 2007). The last two decades have seen an increase in the fundamental need for change in what is considered an ‘acceptable’ occupational health and safety (OHS) performance. This is especially true of in the petrochemical industry. Safety culture in petrochemical industry can also be examined based on the three levels of culture: observable artefacts, espoused values and basic assumptions. The following safety culture components are described under the appropriate level, artefact and/or espoused value and basic assumption. Commitment – Employee perception of an organisation’s safety commitment is key to safety culture. Employees will be more likely to comply if they see managers setting a positive, safe example. Involvement – The greater the involvement of employees in safety, the better. Daily participation in decision-making processes, whether formal or informal, will improve safety performance. Feeling connected to the process will increase motivation to carry out works safely and empower others to do the same. Conversely, workers left feeling disconnected from decision-making are likely to feel disinterested and devalued, potentially leading to diminished safe behaviours. Competence – This combines knowledge, experience and skills to ensure the safe completion of jobs in the face of hazards (Furness and Muckett, 2007). Compliance – Of obvious importance, failure to comply with procedures or safety precautions should not be negotiable. There should be no room for discretion or turning a blind eye to a safety requirement violation (Taylor, 2002). While violation of regulations and procedures signifies a weak safety culture, management must be cautious to avoid hiding behind compliance solely to protect the employer. Accountability – Everyone in the workplace is accountable, not merely for their own safety, but for that of their colleagues. This obviously demands safety in workers’ daily work tasks, but also goes a step further to identifying and addressing problems or potential hazards elsewhere in the workplace (Barraclough and Carnino, 1998). Communication – Effective communication systems are a key characteristic of facilities with strong safety cultures. Thorough dissemination of safety information should include top to bottom and bi-directional communication, through both formal and informal channels. Moreover, the organisation should have an atmosphere that encourages open communication, free from retribution. Face to face channels of communication and open door policies can help to remove barriers to communication. If employees feel strongly about an issue and need to convey its importance to a higher authority, it is imperative to the overall safety improvement effort that they feel comfortable doing so (Olive et al, 2006). Learning – Sporadic classroom lectures are inadequate - training must be comprehensive and on going. Training will be most effective if it is made relevant to the employees. A strong commitment to continuous learning is vital in maintaining an effective safety culture. Lessons need to be learned in every safety situation encountered, and the root causes of those incidents identified. Trust – A ‘no blame’ culture is of paramount importance to safety culture. As was the case with communication, employees need to feel comfortable and secure when questioning safety. To encourage this trust, some organisations even offer staff rewards for providing safety information. Unravelling the issues underlying a lack of trust can be a complex task, as these are often intertwined with other components of safety culture. Recognition – Much like Pavlovian operant conditioning, recognising and rewarding positive behaviours will reinforce them. When people feel their work is appreciated they will not only be happier in their task, they are more likely to work harder. Positive reinforcement through recognition is a powerful tool in changing the safety culture (IAEA, 2002). Group mentality – Humans are social creatures and will generally strive to be part of a group. If the majority of the group demonstrates positive safety behaviours, it will not only be easier to bring others in line with this behaviour, but new staff will be inclined to fall in line with what they will view as the normal behaviour for that workplace. If management lead by example and promote a positive safety culture from the top down, this should permeate through the ranks and instil a strong organisation-wide safety culture. In the extremely high risk environment that is the petrochemical plant, safety is of paramount importance. The last 10 years have seen a significant improvement in health and safety in the petrochemical industry, but there is still more to be done. Designing risk out of the equation is not yet the end of the matter, as accidents and user introduced errors can still come into play. It is therefore crucial that workers are equipped with the necessary knowledge and protection to handle any hazards should they occur.